FYI… if you haven’t realized it yet Thanksgiving is THIS WEEK! Now, don’t go panicking. Start writing your list and tackling each task one-by-one! Christine from Cook the Story and I talked with Merry-Jennifer of The Merry Gourmet. We each shared tips and tricks that we do to get us through Thanksgiving (and keeping us sane while doing so). Watch our Google Hangout below to learn what we do in preparation. As you saw on our chat we are all big fans of making a list. I make list daily so when it comes time for Thanksgiving I’m making list for my list. If your like me, and host Thanksgiving to family that travels out-of-state that also means you need to not only think about the big meal on Thanksgiving but breakfast, lunches, dinners, desserts, snacks, etc for while they are in town. My refrigerator, freezer, and pantry are typically on over load this time of year. Making a list helps you stay on budget. I’m happy to say that I went shopping yesterday and spent just under $200 for 8 mouths to feed for breakfast, lunch, and multiple dinners for 4 days! 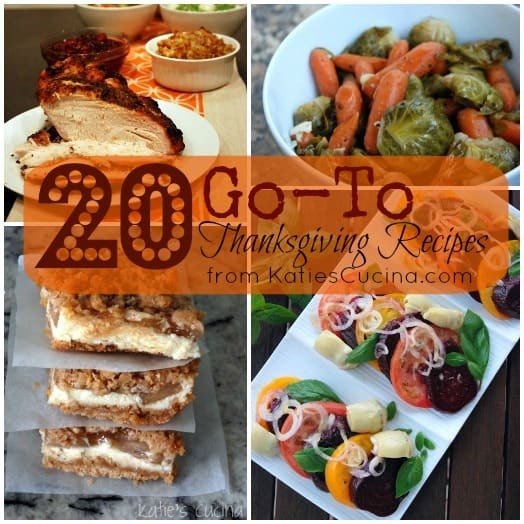 … And for those still planning the menu here are 20 go-to holiday recipes to ease you through Thanksgiving! Spinach Veggie Dip from Mama Loves Food! I hope this mini round-up can help those of you who are at a loss as to what to make! I’d love to hear everyone else’s tips for preparing for Thanksgiving? Is there a particular recipe you have to make each year?